Apply for the new Extensus board! Are you interested in strategy consultancy? 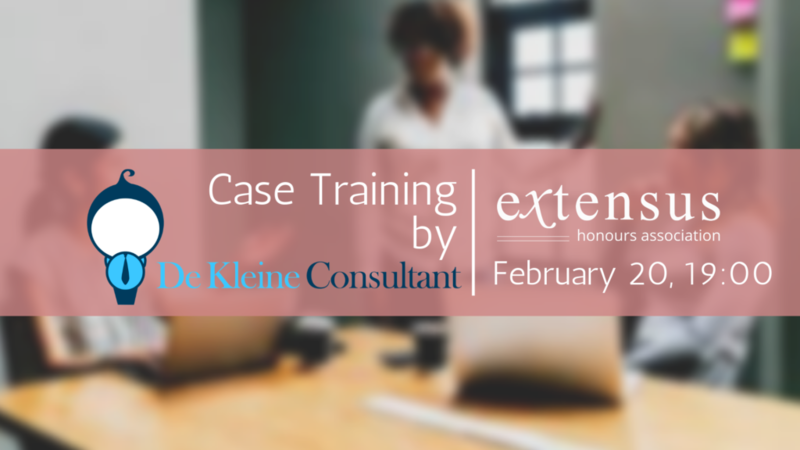 Then join Extensus on February 20th for a case training from De Kleine Consultant! De Kleine Consultant is a non-profit student consultancy firm and gives advice to startups, charities, and foundations. On this evening, you will learn how to approach a consultancy case and how to solve it. De Kleine Consultant will walk you through the case and help you with any questions you might have. Are you looking to challenge yourself and experience what it is like to work on a consultancy case? It event is for you! There will be a borrel afterward!